This ground-breaking book defines the concept of brand relevance using dozens of case studies — Prius, Whole Foods, Westin, iPad and more — and explains how brand relevance drives market dynamics, which generates opportunities for your brand and threats for the competition. Aaker reveals how these companies have made other brands in their categories irrelevant. According to veteran brand guru David A. Aaker, most companies are caught up in a "brand preference" war with competitors. Car manufacturers, for example, fight to get customers who want to buy a minivan — a subcategory of the car market — to prefer their brand of minivans over their competitor’s brands. 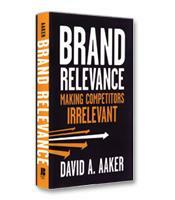 In his new book, Brand Relevance, Aaker argues that instead of trying to entice customers to prefer their own brand, companies should try to make the brand of competitors irrelevant. He calls this fighting the "brand relevance" battle. For example, suppose that Toyota was the only car manufacturer present in the minivan subcategory. What would happen when a customer decides to buy a minivan? The answer, according to Aaker, is that Toyota wins the customer by default. Honda, Chevrolet, Ford and the other brands are irrelevant to the customer since they don’t offer minivans. Of course, Toyota is not the only minivan manufacturer. To make other brands irrelevant, Aaker explains, a company must create its own category or subcategory. This is the core theme of Brand Relevance. To answer readers who may believe such a goal may be fine in theory but impossible in practice, Aaker offers numerous examples and case studies. One of those examples is Enterprise Rent-a-Car. When Enterprise was started in St. Louis in 1962 with just 17 vehicles, the car rental industry was completely dominated by nationally known players, such as Hertz and Avis. By 2008, however, Enterprise had sales of $10.8 billion compared to $6.7 billion for one-time industry leader Hertz. The reason for Enterprise’s success is remarkably simple. It created a subcategory of the car rental industry. Traditionally, the car rental industry was built on the airport business: When people flew into a city, they needed a car. However, Jack Taylor, the founder of Enterprise, saw a need for rental cars for people in their home cities — mostly for when they were getting their own cars repaired. Taylor thus started putting his car rental outlets close to where people lived, in numerous locations throughout cities, and in small towns where no car rental agency had ever been placed. For three decades, the other car rental agencies continued to focus on the lucrative airport market, leaving Enterprise alone in serving people in their own cities. In Aaker’s term, when customers wanted to rent a car while their car was in the shop, Hertz, Avis and other brands were irrelevant. Enterprise was the only brand relevant to that need. Of course, creating successful categories and subcategories is not easy. Aaker offers guidelines for readers to generate new ideas and concepts, including looking at market trends and new technologies, or considering why non-customers are not buying in a certain category or subcategory. He also details, in separate chapters, how to evaluate new ideas, how to define the new categories or subcategories, and finally how to manage these categories/subcategories successfully. One of the key lessons of the book is that new categories and subcategories must be protected through barriers to entry. In other words, competitive brands must not only be made irrelevant through a new concept, but must be kept irrelevant. Enterprise for example, had several barriers to entry that kept Hertz and other competitors out of their space. The first was blanketing cities and towns with its agencies, which, because they were far from the airports, did not have the same cost structures as competitor agencies. Enterprise had also built an Automated Rental Management System that helped facilitate bookings and billings for insurance companies and repair shops. As with all of Aaker’s books, Brand Relevance offers new thinking, thoughtful analysis and practical advice supported by numerous in-depth examples (including how college student Jared Fogle helped Subway create the healthy fast food subcategory). Although intended for a marketing audience, entrepreneurs may want to read this for inspiration; after all, their little start-up might be the new Enterprise.